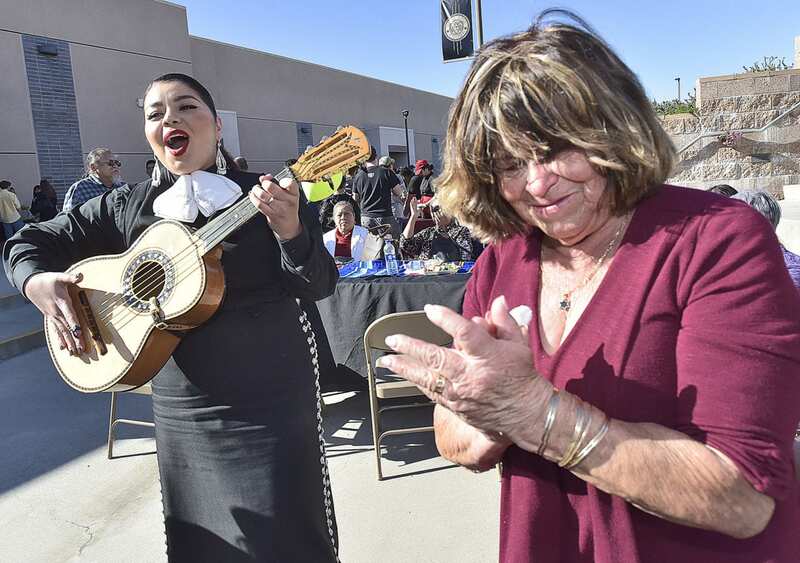 Raquel Guerrera, right, applauds after singing along with Wendy Alarcon of Mariachi Las Catrinas at the Golden Valley High School Quinceanera, celebrating 15 years of growth and excellence held at Golden Valley High School in Santa Clarita on Saturday. | Photo: Dan Watson/The Signal. In celebration of its 15 years of educating the students and community of Santa Clarita, Golden Valley High School held a quinceanera celebration Saturday. Complete with a discussion on the history of quinceaneras presented by GVHS students Juan Palara and Itzel Perez, mariachi music, Folklorico dancers and a taco bar, close to a hundred community stakeholders and those with ties to Golden Valley attended the free event. Palara, a sophomore enrolled in AP Spanish Literature at the school, said the event was a commemorative event to celebrate the school. One such resource in attendance at the event, the Golden Valley Parent Awareness, Workshops and Support (PAWS) Center, was there and distributing free bags full of day-to-day essentials as well as free informational pamphlets about what PAWS provides for local families in need. “We have toys, cereal, water bottles, soccer balls and flyers about our center (in the bags),” said April Rego, a coordinator at the PAWS center. Attendee Joe Zamora prepares tacos for his family at the Taco bar at the Golden Valley High School Quinceanera on Saturday. | Photo: Dan Watson/The Signal. Also in attendance at the celebration were a number of “original” staff members, faculty members and teachers who have been with the school since it first opened in 2004.